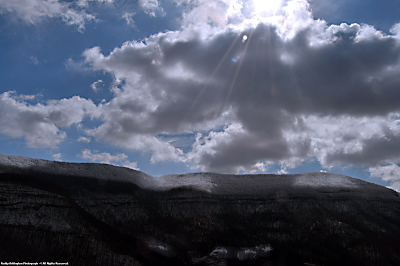 Following days of abundant low-level moisture in sub-freezing air, I knew a big show was going to be displayed as soon as cloud bases lifted and sunshine returned to illuminate the highcountry! 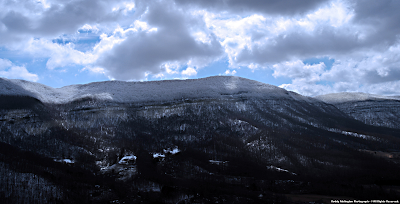 [ The above photograph displays great Grindstone Ridge Dome of the High Knob Massif with Rocky Hollow Gap illuminated by blazing RIME to the left, as a high crestline adjacent to Beaverdam Gap shines toward far right. Heavy RIME and deep snow capping the sprawling massif, along and upward from the magnificent belt of calcareous cliffs which ring it for more than 50 miles ]. Looking up Powell Valley, the lofty crestline of the High Knob highcountry stood like an awesome wall as sunshine began to break through the low cloud deck ( with miles and miles of highcountry spreading outward beyond its visible front edge ). My friend Roddy Addington offers the above scene for those not able, or lucky enough, to view the deeply snow laden highcountry from its top! 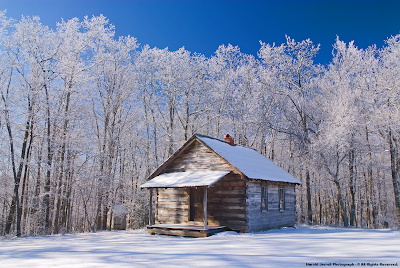 [ With snow knee to locally waist deep along its upper north slopes and crestlines, it was a sight to behold under a sky so richly blue that it actually trended toward blackness amid dry, pristine air at the highest elevations ]. 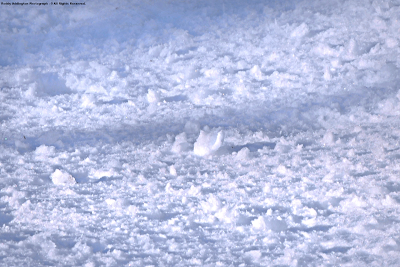 Without a Lookout Tower it is not currently possible to truly show the extent of RIME covered highcountry across the great massif, which is even difficult to detect on standard NASA imagery due to the folded nature of much of its terrain. Views far beneath the lofty crestlines were so spectacular that most were fulfilled to just be alive to witness such great majesty! Rocky Hollow lives up to its name as a jagged boulder filled chasm that offers truly precipitous passage through the great calcareous belt of huge cliffs ringing the massif. [ It features a mostly subterranean stream that gushes water into Butcher Fork of the South Fork of the Powell Basin during only the wettest of conditions ]. 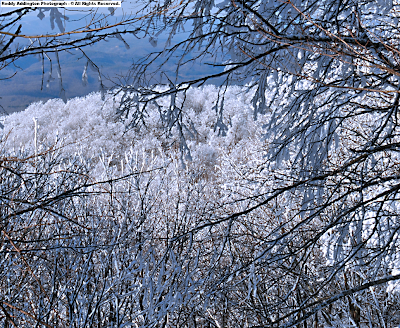 Like sparkling diamonds, trees standing upon the RIME coated edge of lofty Big Cherry Basin blaze with an unreal brilliance amid upper reaches of South Fork Gorge of the High Knob Massif. 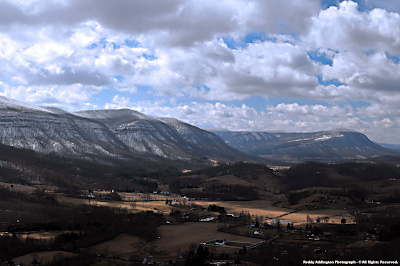 [ Big Cherry Basin spreads northeastward for 5 to 6 air miles from the above photograph, with elevations that vary from 3000 feet downstream of Big Cherry Dam to 4223 feet at its head on High Knob. It is a true water capturing wonder amid the sky! ]. 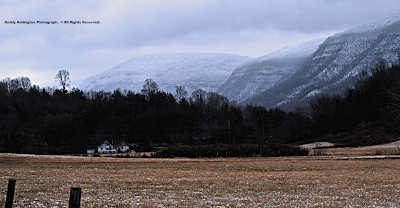 From a different viewpoint, the brown valley floor visible within distant background farthest away, in the above scene, is looking up toward the nearly straight portion of RIME coated crestline in the previous photograph ( the southeastern rim former of majestic Big Cherry Basin, and head of South Fork Gorge, called Little Mountain of the High Knob Massif ). [ In the photograph above, and also below, is another rise of rime capped terrain within the highcountry right of the nearly straight running crestline of Little Mountain ( in the far distance ). 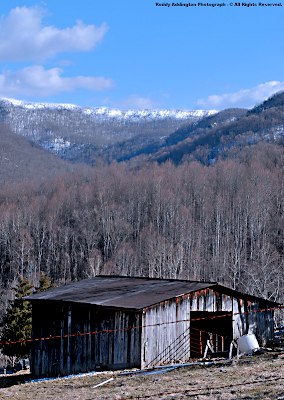 That is Thunderstruck Knob, rising above the remote backcountry of the massif to divide the heads of majestic Stock Creek and Cove Creek basins ( wondrous multi-gorge complexes ) ]. As seems so often the case, a truly dramatic difference was again observed within the interior snow shadow of this great mountain landform as brown valley fields stand in stark contrast to its snow laden, rime capped highcountry. 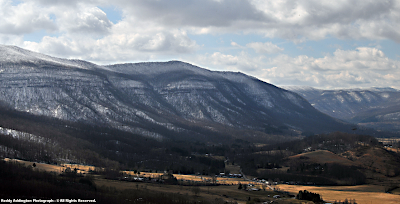 [ A contrast not visible in the above scenes, but certainly felt and measurable, is the equally dramatic temperature difference which occurs between Powell Valley and those highly elevated, snow laden valleys within the High Knob Massif ( although cold air drainage from the highcountry can make portions of "The Valley" colder at times ). An excellent example being morning hours of March 5, with 0 to 10 above zero readings over deep snow in the highcountry getting much colder than experienced on the mostly snow barren floor of Powell Valley. Of course, this contrast is supported by 1000 to 2000 feet of elevation difference between the valley floors! ]. Blocks of rime weighing down trees after days spent in sub-freezing cloud vapor began dropping off to the highcountry snowpack to add more water content to its volume. 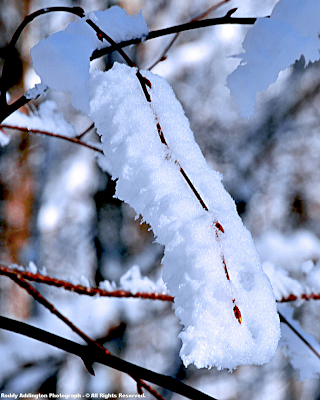 Rime began falling upon the deep snow even with temperatures below freezing during March 4, amid brilliant afternoon insolation, so that by later on March 5 ( with highcountry temps remaining around or below freezing ) most of the rime had dropped from trees to enrich the snowpack. 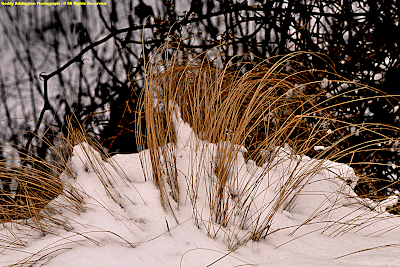 Before a BIG, wet storm system arrives during the second week of March we should hope and pray most of this deep snowpack melts away to reduce high water potential ( highcountry lakes, ponds, wetlands, sinking creeks, and well developed subterranean conduit systems helping reduce flood potential much more than in most mountain landscapes ). Conditions leading up to "The Big Show" featured persistent low clouds, upslope snowfall, and unseasonably cold conditions during Mar 1-3. [ Note this is being labeled Part I since this is MARCH and other "Big Shows" are likely to occur amid the weather & natural world of this 2009-10 winter season...DARE, I say! ]. 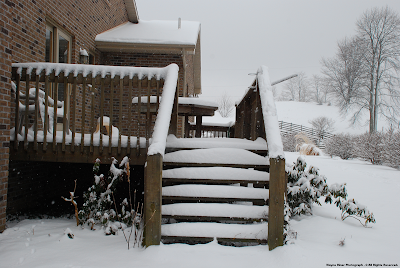 My friends Darlene & Joe Fields measured 7" to 8" of new snow depth in High Chaparral of High Knob during March 1-4, to push the season tally to 122.0" at their 3300 foot elevation. [ High Chaparral is 4.0 air miles almost due east of High Knob, at an elevation that is 923 vertical feet lower than its peak, upon the edge of the main crest zone of the massif ]. 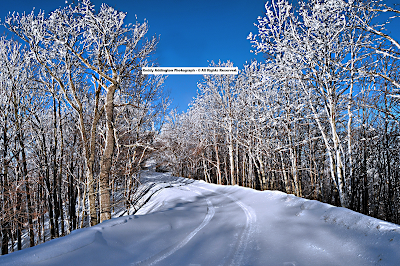 Seasonal snowfall totals for 2009-10 pushed into the 150-200" bracket at highest elevations within the High Knob Massif, with around 160" on Eagle Knob ( elevation 4189 feet ). Snow was also significant along the Tennessee Valley Divide, with my friends and NWS observers Wayne & Genevie Riner measuring 6.3" during the March 1-4 period. New snowfall created majestic settings in the highlands, as captured beautifully by Wayne Riner. 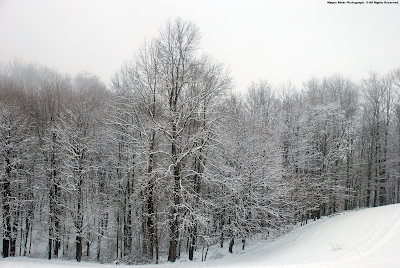 This latest upslope event pushed the 2009-10 winter snowfall tally to around 80" ( 78.4" ) on Long Ridge of Sandy Ridge, at 2650 feet above sea level ( similar elevation to the Wise Plateau ). 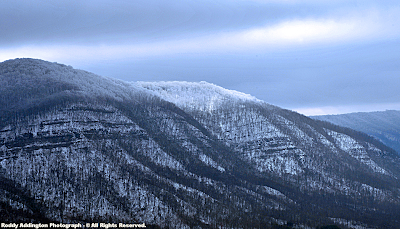 If the difference in snowfall observed between High Chaparral and Long Ridge were extended upward in this area, it would suggest a total of 184" for the summit level of the High Knob Massif. [ The above assuming a linear increase in snowfall with elevation within the local area. In reality, however, many factors work to skew this away from linearity, especially within upper elevations. This would certainly not be even reasonable to consider outside of a local area, as different regions are impacted by greatly varied weather patterns ( reference notes on Max winter totals below ) ]. Such a total would certainly be reasonable given the 160.5" of snowfall recorded for Eagle Knob is only a conservative best estimate. [ Although conditions are monitored on Eagle Knob every day it is very difficult to obtain accurate readings in both rain and snow due to large amounts of cross crestline flow and turbulence that tends to vary with wind directions and speeds associated with orographic forcing ( strongest during November to May ). Max winter totals could in reality be off the main crestline, upon upper slopes & high basins within the main crest zone stretching west and southwest of the Burns Creek-Little Stony Creek watersheds ( where total lifting, upslope funneling, and unique orographically forced circulations of air tend to be maximized within the great massif ). 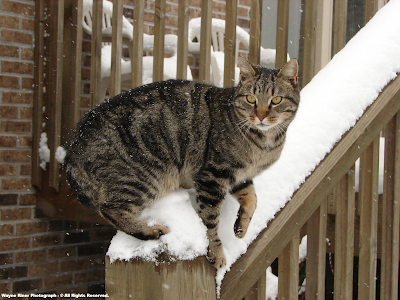 [ My detailed climatological studies during past winter seasons have shown a nearly linear increase in snowfall amounts with elevation from the Norton Valley upward to High Chaparral. From High Chaparral to the summit level, however, the increase in snowfall was found to become greater than linearity due to events each winter that impact only the highest elevations ( and over the longer term to excessive enhancements of snow driven by unique orographic circulations, such as that associated with the great December 18-19, 2009 Mega-Dump ). 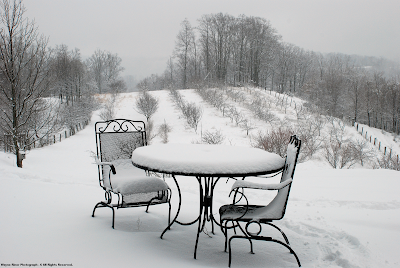 "The snow was ending in a gust of wind as I stood near the cherry tree watching the birds feed. The white-breasted nuthatch griped the tree with his extra long claws. My grandmother called them "upside-down birds" because of their ability to walk either up or down a tree with equal ease." The White-breasted Nuthatch has always been one of my favorite birds, with Red-breasted Nuthatches ( Sitta canadensis ) of the High Knob highcountry, and mature forests within lower elevations like Breaks Interstate Park, also being a true pleasure to hear and watch! December 18-January 12 ( 26 days ): 52-71"
January 29-March 4 ( 35 days ): 62-78" . That equates to 61 days of productive snow making by Mother Nature, with 114-149" during that time accounting for the bulk of the 2009-10 seasonal tally ( above 3000 feet ). [ Totals being less at lower elevations, but also potentially more within max locations in upper elevations of the massif ( as was previously suggested ) ]. 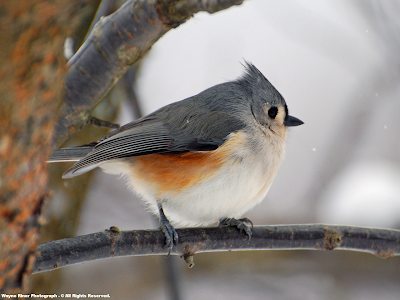 "The Tufted Titmouse has picked many seeds from the feeder only to carry them to the eve of the house near the window. 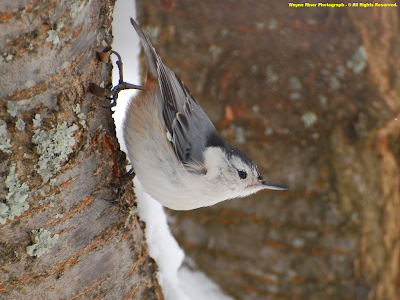 After looking around to see if anyone was watching, it would hide the seed for another day." [ As of early on Sunday, March 7, a snow depth marker on Eagle Knob had around 20" of depth where insolation hits from sunrise to sunset on days with no clouds. Shady, colder locations on upper north slopes had locally much more depth remaining ]. 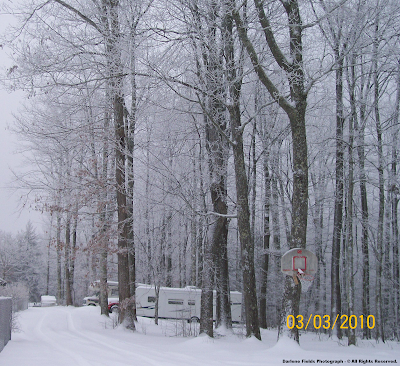 Of additional interest, March makes the 4th consecutive month that snow depths have reached 2-3+ feet within deeper portions of the High Knob Massif during the 2009-10 winter season. 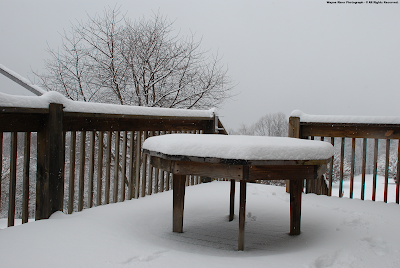 [ February marked the 3rd consecutive month that snowfall totals exceeded 43" on Eagle Knob ]. 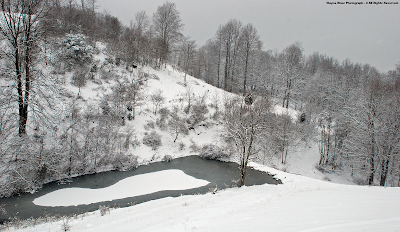 For a third consecutive night, amid bone dry air, temperatures in high valleys were plunging through bitter 10s toward a destiny with 0 to 10 above readings yet again within lofty, snow laden basins of the High Knob Massif ( into AM hours of March 7 ). 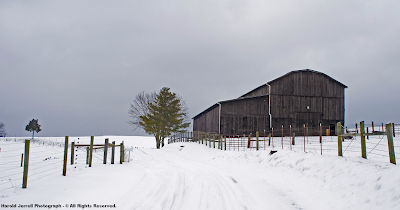 [ The first 7 days of March 2010 featured a mean temperature of 26.8 degrees in the City of Norton, with upper 10s to middle 20s being common across the High Knob Massif ( driven downward by these bitter cold nights ) ]. Yet, HOPE is alive...and growing! 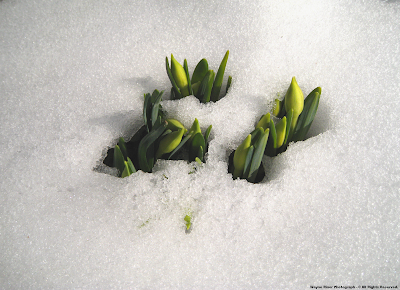 "Even though the melting snow greets the emerging flower, they feel as I do...it's surely about time for spring." 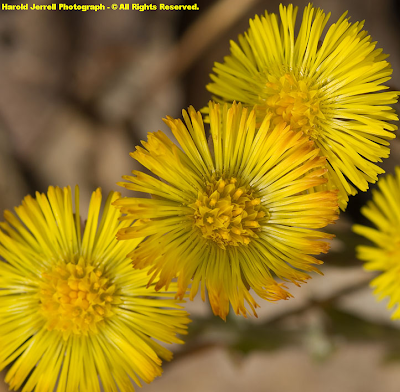 One of the first wildflowers of the season to watch out for now is Coltsfoot, which typically grow along ditch lines and in damp places beneath leaves until they get big enough to push upward into view. Perhaps "The Big Show Part II" will feature a glorious array of spring wildflowers! But, then again, perhaps NOT!